Providing a passion and tenacity in bringing the construction industry together on all matters related to Building Information Modelling. I bring a deep understanding of the challenges and opportunities on BIM adoption in practice and have a global contact base of the players throughout the construction industry – from software providers to user group leads and recruitment channels. The Air Conditioning and Mechanical Contractors’ Association (AMCA) in partnership with its Gold Partner C.R. Kennedy are pleased to showcase the people, processes and technologies that will help deliver the eighth successful event. Joining CR Kennedy, the international keynote speaker is Mr Matt Wheelis, Segment Manager, Building Construction of Leica Geosystems. Matt leads Leica’s sales and business strategy for the Building Construction segment in North America for all product lines including Construction Layout and Reality Capture. Prior to joining Leica, Matt held Senior Management positions at Autodesk, where he led industry strategy for construction and project collaboration across building, heavy, and industrial construction. His accomplishments include establishing job cost control in the cloud and advancing multiple SaaS / Cloud, mobile and BIM solutions for construction. With a BA in Accounting and Master of Civil Engineering, Matt brings a unique perspective to advancing construction technology at all levels. Joining Matt Wheelis and the CR Kennedy team will be Matt Rumbelow, a past presenter at the AMCA Construction Innovation Forum. Matt has recently taken up a role within the Building Construction segment. A graduate with honours in architecture from UniSA, Matt has a deep understanding of the challenges and opportunities that BIM can bring in practice. His work with global BIM leaders such a Lecia, Autodesk, Trimble, and Solibri, Matt is uniquely placed to identify benefits and develop strategies that leverages the potential of BIM technologies across different industries. Matt is particularly excited about the availability of the BLK360 scanner in Australia. Matt’s previous experience with laser scanning and point cloud acquisition with both clients and vendors highlights just how revolutionary this instrument will be for many outside the traditional survey field. Matt will be joined at the forum by thought leaders and practitioners from across the supply chain, each providing unique insight into how leading firms such as Bryden Wood, Turner, McKinstry, Woods Baggot, COWI and Autodesk are utilising technological advancements to deliver innovative best practice solutions in the building and construction industry. The exclusive Australian distributor for all Leica Geosystems products and solutions is the highly-respected family company C.R. Kennedy and Co. In recent times, the survey division of C. R. Kennedy and Co. has grown to be one of the world’s foremost and respected suppliers of precision positioning products and spatial solutions from Leica Geosystems. With offices throughout Australia, C.R. Kennedy Survey has been a constant presence during the last few decades supplying technologies from Leica Geosystems onto most of the infrastructure, mining, land development and construction projects the country has seen. Leica Geosystems is part of Hexagon (Nasdaq Stockholm: HEXA B, hexagon.com), a leading global provider of information technology solutions that drive productivity and quality across geospatial and industrial landscapes. This entry was posted in Uncategorized on August 23, 2017 by rumbelom. As the premier event of its kind in Adelaide, we are pleased to showcase some of the people and technologies that will make the joint conference on August 11th such a success. Presenting a keynote address is the Vice President of Business Development at Leica Geosystems, Mr Faheem Khan. With more than 20 years of experience, Faheem Khan oversees global strategy for the development of the Leica’s laser scanning solution portfolio, and leads the software product management organisation. Faheem’s presentation will acknowledge that our industries are constantly in change. Leica’s major technological advances including the BLK360 scanner create link are driving the growth of reality capture solutions and reshaping our expectations to better in-form BIM, GIS and survey processes. Assisting Faheem and the C R Kennedy team will be Matt Rumbelow, who has returned to Adelaide to work with the our new Building Construction segment. A graduate with honours in architecture from UniSA, Matt has deep understanding of the challenges and opportunities that BIM can bring in practice. His work with global BIM leaders such a Lecia, Autodesk, Trimble, and Solibri, Matt is uniquely placed to identify benefits and develop strategies that leverages the potential of BIM technologies across different industries. BuildSA & SSSi Spatial Information Day visit the event page. About C.R.Kennedy: The exclusive Australian distributor for all Leica Geosystems products and solutions is the highly-respected family company C.R. Kennedy and Co. In recent times the survey division of C. R. Kennedy and Co. has grown to be one of the world’s foremost and respected suppliers of precision positioning products and spatial solutions from Leica Geosystems. With offices throughout Australia, C.R. Kennedy Survey has been a constant presence during the last few decades supplying technologies from Leica Geosystems onto most of the infrastructure, mining, land development and construction projects the country has seen. About Leica Geosystems: Revolutionising the world of measurement and survey for nearly 200 years, Leica Geosystems is the industry leader in measurement and information technologies. We create complete solutions for professionals across the planet. Known for innovative product and solution development, professionals in a diverse mix of industries, such as surveying and engineering, building and heavy construction, safety and security, and power and plant trust Leica Geosystems for all their geospatial needs. With precise and accurate instruments, sophisticated software, and trusted services, Leica Geosystems delivers value every day to those shaping the future of our world. Leica Geosystems is part of Hexagon (Nasdaq Stockholm: HEXA B, hexagon.com), a leading global provider of information technology solutions that drive productivity and quality across geospatial and industrial landscapes. This entry was posted in Uncategorized on July 27, 2017 by rumbelom. Very proud to represent Arup at the annual prefabAUS conference held at Melbourne University. The presentation which was sponsored by memko and Dassault Systemes showed how the prefabrication industry can leverage from the sophisticated technologies that have been developed and refined by the Automotive and Aerospace sectors. The conference was opened yesterday by The Hon. Lily D’Ambrosio. Read about her opening comments and the ‘new era’ of prefabricated construction in The Australian Financial Review. It was great to present to the attendees how Arup has provided consulting services for innovative prefabrication projects both locally and internationally, and highlight the collaboration of the Arup US teams on landmark Atlantic Yard project. 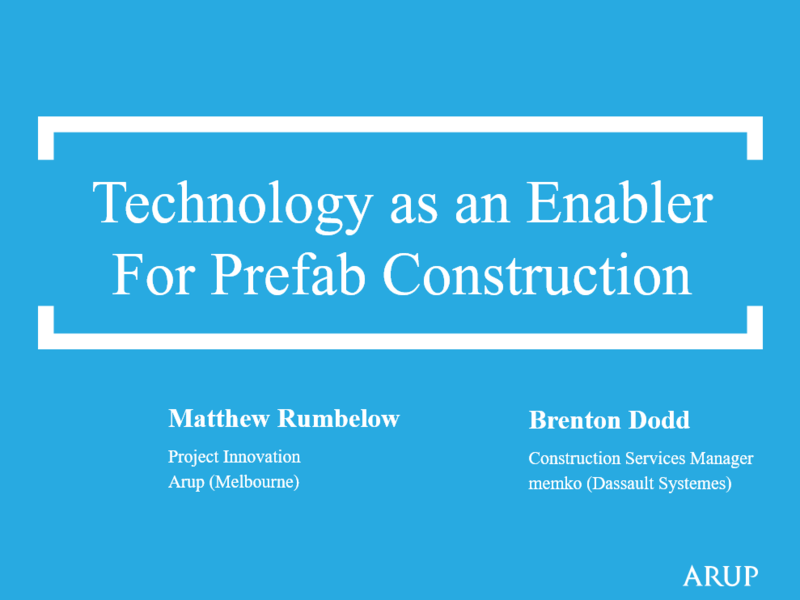 For more information regarding the conference presenters and topics covered, visit the prefabAUS site here. This entry was posted in Uncategorized on September 16, 2015 by rumbelom. This weeks BIM-MEP AUS Construction Innovation Forum will be the sixth time that Sumit Oberoi and his team from the AMCA have gathered the best BIM thinkers from around the world to present on the latest for the MEP industry. Six years makes this one of the longest running BIM events, and certainly one of the most accessible, both in terms of registration fees and published content. 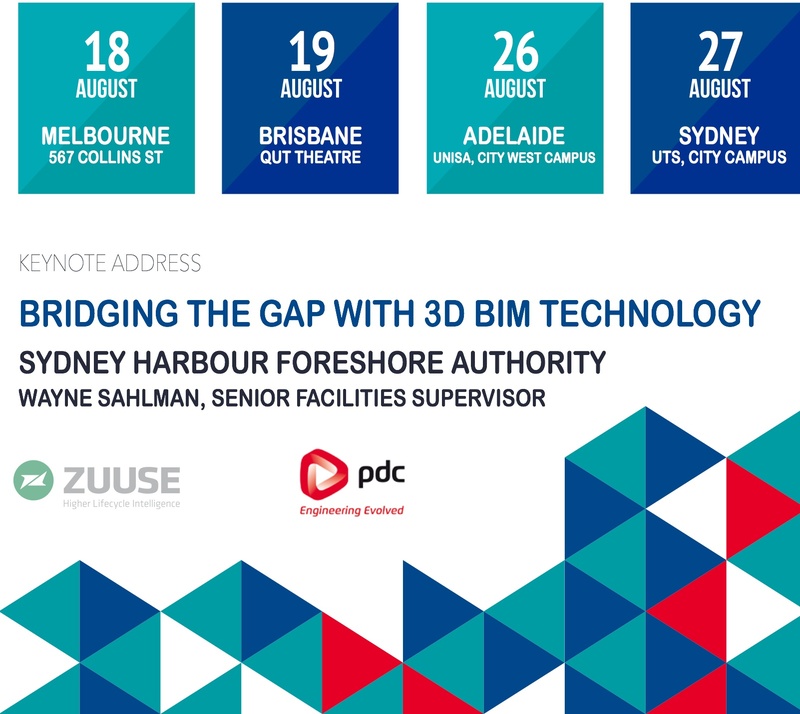 Six years later the admission price is still under AU$1000, and the professionally recorded presentations are still available FOR FREE for the entire BIM community. In fact as we count down to CIF2015 starting Thursday, I recommend that you review the fantastic keynotes and industry benchmarks that BIM-MEP AUS has achieved. And lastly, but certainly not least, I would like to publicly acknowledge the tireless work of Sumit Oberoi in particular. Having been involved in almost every version of BIM event across the country, and running a few myself, the effort and ability shown my Sumit (and his team) is to be commended. Sumits ability to bring the BIM leaders and vendors into the same room is extraordinary, as well as his continued interest in the technological developments which allows the AMCA members to rightly claim to be the most BIM ready of the entire AEC industry. 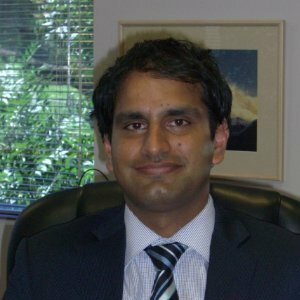 Moreover, Sumit has championed the education of the industry, and has been heavily involved with the newly opened ITH facility at Box Hill. Designed in collaboration with the AMCA, the ITH is home to the Refrigeration and Climate Control Centre of Excellence (RCCC) in partnership with the Air-Conditioning and Mechanical Contractors Association (AMCA) and the RCCC, it provides the main training facilities for the air-conditioning and allied industries. Whilst there are certainly more vocal and public proponents of BIM with the Australian AEC industry, I would contend that very very few would be able to list the achievements and advancements that Sumit has been involved with across his six years of service to the BIM-MEP AUS initiative. Whilst this certainly not a eulogy for Sumit (perhaps more like a BIMroast! ), if you get a chance to speak with him and his team this week at CIF2015, I think a thanks would be in order. This entry was posted in Uncategorized on August 3, 2015 by rumbelom. As a previous presenter at the Construction Innovation Forum (BIM MEP AUS), I am looking forward to another outstanding event hosted by the hard working team at the AMCA. I am impressed by the wide variety of technologies and vendors that have been brought together for this years conference, including Dassault Systems, Trimble and Aconex. Watch this space for further news regarding the speakers and content being featured at CIF2015, and if you cant wait until August, relive some of the “moments” of CIF2014 below! See my previous post about CIF2014 here. This entry was posted in Uncategorized on July 28, 2015 by rumbelom. 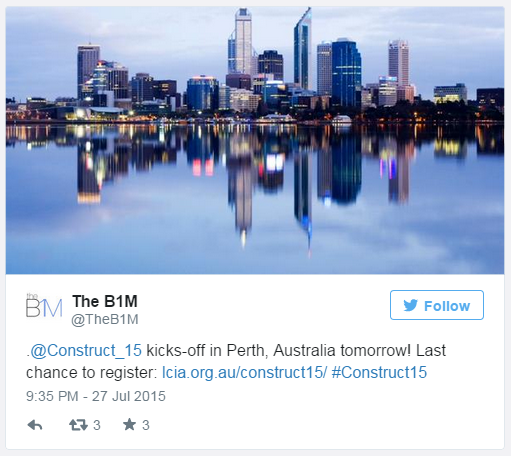 Great to finally see @Construct_15 kick off in Perth today. Since November of 2014, a lot of blood, sweat, spit & tears have gone into this event, which is by far the largest I have been involved with. Speakers from all over Australia and New Zealand as well as another 22 countries travelling to Perth to share “Global Knowledge and Global Solutions” for the construction industry over 4 days. Due to professional reasons (well beyond my control! ), I am unable to attend the event personally, but am there in spirit, tweets and webmastery.